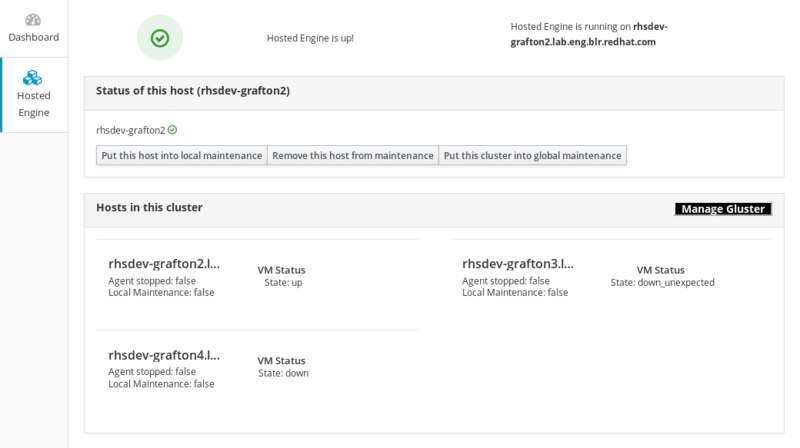 After Red Hat Hyperconverged Infrastructure for Virtualization has been deployed, you can perform many operational and management tasks for Red Hat Gluster Storage using Cockpit. Read this book to understand how to manage storage using Cockpit. This document explains how to perform maintenance tasks specific to Red Hat Hyperconverged Infrastructure for Virtualization. 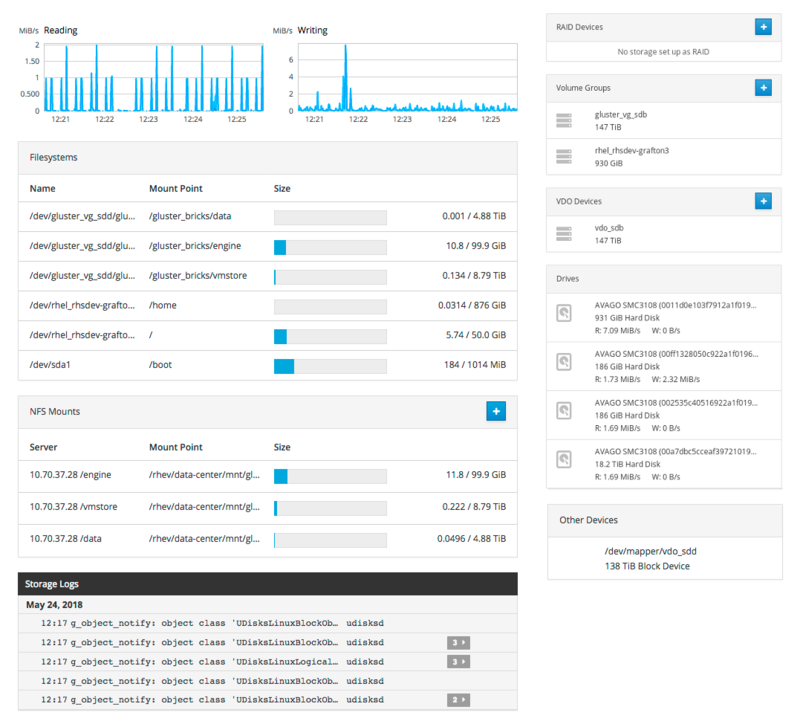 The Storage Dashboard in Cockpit provides an overview of I/O operations, volumes, and devices available to the server. Navigate to the Storage Dashboard by logging into Cockpit and clicking the hostname, followed by Storage. The Storage Dashboard is divided into a number of sections. A graph of the amount of data read in the last five minutes. The scale of the graph adjusts automatically according to server load. A graph of the amount of data written in the last five minutes. The scale of the graph adjusts automatically according to server load. A list of file systems hosted on this server showing their name, mount point, size, and used versus total storage capacity. Clicking on a file system opens the Volume Group Overview page. See Section 1.2, “Understanding the Volume Group Overview page” for more information. A list of exported file systems that have been mounted by client systems. A list of recent events and log messages related to storage. A list of RAID devices configured on the server. Clicking a RAID device opens the RAID Device Summary page. Clicking + opens the Create RAID Device window. See Section 3.1, “Configuring a new RAID Device using Cockpit” for more information. 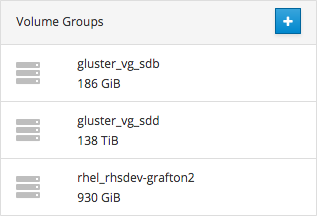 A list of volume groups configured on the server. Clicking a volume group opens the Volume Group Overview page. Clicking + opens the Create Volume Group window. See Section 5.1, “Creating a volume group using Cockpit” and Section 1.2, “Understanding the Volume Group Overview page” for more information. A list of Virtual Data Optimizer devices configured on the server. Clicking a VDO device opens the VDO Device Summary page. Clicking + opens the Create VDO Device window. See Section 4.1, “Creating a Virtual Data Optimizer using Cockpit” and Section 1.3, “Understanding the VDO Overview page” for more information. A list of drives in use by the server. Clicking a drive opens the Drive Summary page. See Section 1.4, “Understanding the Drive Overview page” for more information. A list of other devices attached to the server, that are not yet used. The Volume Group Overview page in Cockpit provides an overview of a volume group, the physical volume it resides on, and the logical volumes that are part of that volume group. Navigate to the Volume Group Summary page for a file system or volume group by logging into Cockpit and clicking the hostname, followed by Storage, and clicking any file system or volume group. The Volume Group Overview page is divided into several sections. A summary of volume group details, showing name, UUID and capacity. You can also rename or delete the volume group from here. A list of physical volumes underlying this volume group. Clicking + opens the Add Disks window, which lets you add more disks to the volume group. A list of logical volumes in this volume group, with volume management operations. Clicking a volume shows more details and operations for that volume. 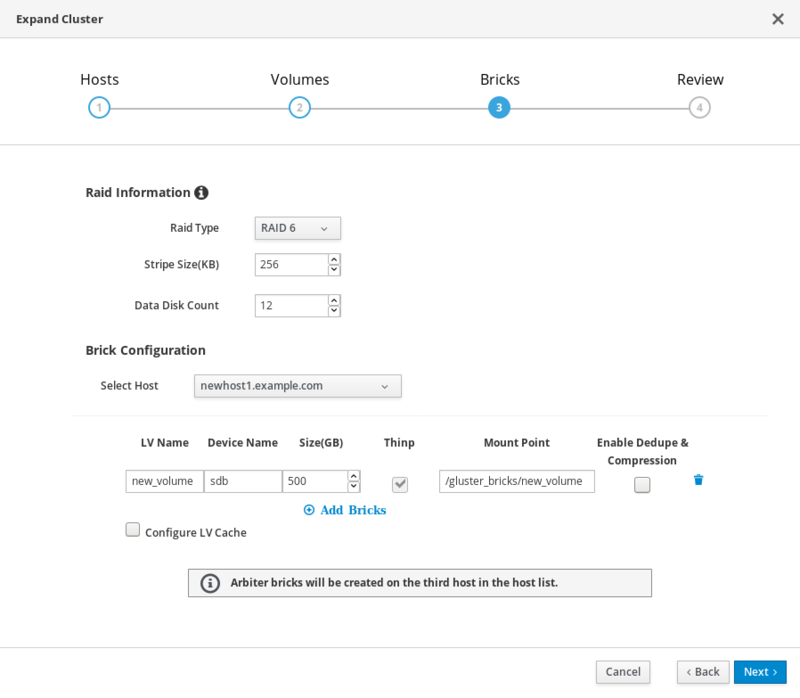 See Chapter 7, Managing logical volumes using Cockpit for more information. The VDO Overview page provides an overview of Virtual Disk Optimizer devices and their contents. Navigate to the VDO Overview page for a VDO device by logging into Cockpit and clicking the hostname, followed by Storage, and clicking any device listed under VDO Devices. The VDO Overview page is divided into several sections. A summary of the details of this VDO device, showing the device file location, the drive backing the VDO device, and the physical and logical space available. Several VDO management operations are also available. A summary of the volumes residing on this VDO device. The VDO Overview page also provides access to a number of VDO management operations. See the following sections for more information about each operation. See Understanding VDO for more information about VDO devices. The Drive Overview page provides an overview of any drives or disks attached to the server, and any partitions on those drives. Navigate to the Drive Overview page for any drive by logging into Cockpit and clicking the hostname, followed by Storage, and clicking any drive listed under Drives. The Drive Overview page is divided into several sections. A summary of drive details, including the drive model, firmware version, serial number, capacity, and device location. A summary of partitions on this drive. You can modify the partition table on the drive, or format a partition here. Follow these steps to create a new partition table on a drive using Cockpit. Click the hostname → Storage. Click any drive under Drives. The Drive Overview page opens. The Format device window opens. Specify whether to Erase existing data completely by overwriting it with zeroes. Specify the Partitioning style to use. Follow these steps to format a partition with a file system using Cockpit. Click the device under Content. In the Filesystem subtab, click Format. The Format Device window appears. Specify the file system Type to use. Specify a Name for the file system. Specify whether to use default or customized Mounting behavior. If you selected Custom, specify a Mount Point and check any Mount options you want this file system to use. Click the + button beside RAID Devices. The Create RAID Device window opens. Specify a Name for your RAID device. Specify the RAID Level to use. Only RAID5 and RAID6 are supported for RHHI for Virtualization. Leave the Chunk Size as the default value. Check the Disks to use in creating the RAID device. Follow these steps to create a new VDO device. Click the + button beside VDO Devices. The Create VDO Device window opens. Specify a Name for the new VDO device. Specify the Disk to use for the new VDO device. Specify the Logical Size for the new VDO device. Specify the Index Memory size for the new VDO device. Check any Options you want the new VDO device to use. Follow these steps to increase the logical size (the amount of data it can store by using compression and deduplication) of a VDO device. Click the hostname → Storage. The Storage Dashboard page opens. Under VDO Devices, click the VDO device. The VDO Device Overview page opens. The Grow logical size of device window opens. Drag the slider or enter a numeric value to set the new logical size of the VDO device, and click Grow. Follow these steps to prevent future writes to the VDO device being compressed. This does not affect the compression of existing data on the VDO device. Click the Compression toggle under the device summary so that OFF is displayed. Follow these steps to prevent future writes to the VDO device being checked for duplication. This does not affect the deduplication of existing data on the VDO device. Click the Deduplication toggle under the device summary so that OFF is displayed. Follow these steps to stop a VDO device for maintenance operations or deletion. Stop any volumes running on the VDO device. Follow these steps to delete a VDO device. Click the + button beside Volume Groups. The Create Volume Group window opens. Specify a Name for the volume group. Check the Disks to use for the volume group. Follow these instructions to expand a volume group using Cockpit. Click the volume group. The Volume Group Overview page opens. Click the + button beside Physical Volumes. The Add Disks window opens. Check the Disks you want to add to the volume group. The capacity of the volume group is extended automatically. Now that you’ve added new storage to the volume group, you may want to grow your thin pool or grow your logical volume. Follow these instructions to rename a volume group using Cockpit. The Rename Volume Group window opens. .. Specify a new Name. .. Click Rename. The volume group is renamed, and the change is propagated to all logical volumes in the volume group. This does not affect the naming of thin pools. Follow these instructions to delete a volume group using Cockpit. In the Volume Group summary, click Delete. Follow these instructions to create a logical thin pool using Cockpit. Click + Create new Logical Volume. The Create Logical Volume window opens. Specify a Name for your thin pool. 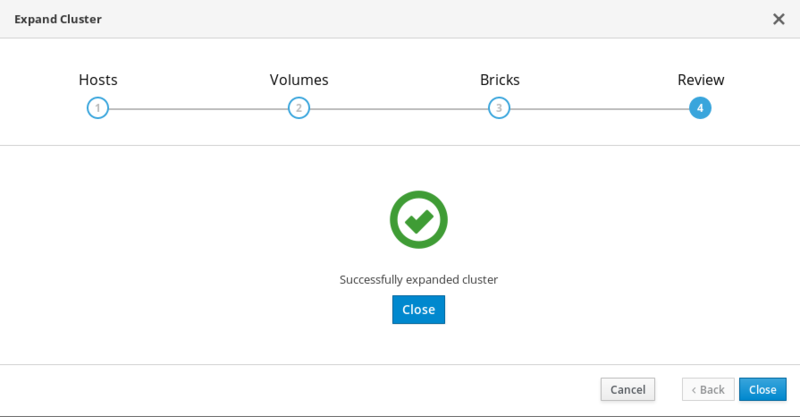 Set Purpose to Pool for thinly provisioned volumes. Specify a Size for your thin pool. Your new thin pool appears in the list of logical volumes in this volume group. Follow these instructions to increase the size of a logical thin pool using Cockpit. On the Pool subtab, click Grow. The Grow Logical Volume window opens. Specify the new Size of the thin pool. Follow these instructions to deactivate a logical thin pool using Cockpit. This deactivates all thinly provisioned logical volumes in the pool. The thin pool is deactivated. Follow these instructions to activate a logical thin pool using Cockpit. The thin pool is activated. This does not activate thin provisioned logical volumes in the pool. Follow these instructions to activate a logical volume using Cockpit. Click Create Thin Volume beside the thin pool that should host the volume. The Create Thin Volume window opens. Specify a Name for the new volume. Specify a Size for the new volume. The new volume appears in the list of logical volumes. Specify a Name for your logical volume. Set Purpose to Block device for file systems. Specify a Size for your logical volume. Your new logical volume appears in the list of logical volumes in this volume group. Follow these instructions to deactivate a logical volume using Cockpit. Follow these instructions to delete a thinly- or thickly-provisioned logical volume. Click Delete in the logical volume summary. Follow these instructions to increase the size of a logical volume using Cockpit. On the Volume subtab, click Grow. The Grow Logical Volume window opens. Specify the new Size of the logical volume. Follow these steps to format a logical volume with a file system using Cockpit. Click any volume group under Volume Group. The Volume Group Overview page opens. On the Filesystem subtab, click Format. If this logical volume does not have an existing file system, this tab is labelled Unrecognised Data. On the Filesystem subtab, click the value of Mount Point. The Filesystem Mounting window opens. Specify a behaviour to use for Mounting. If you select Custom, specify a Mount Point and check any Mount Options you want to use. On the Filesystem subtab, click Mount. On the Filesystem subtab, click Unmount. 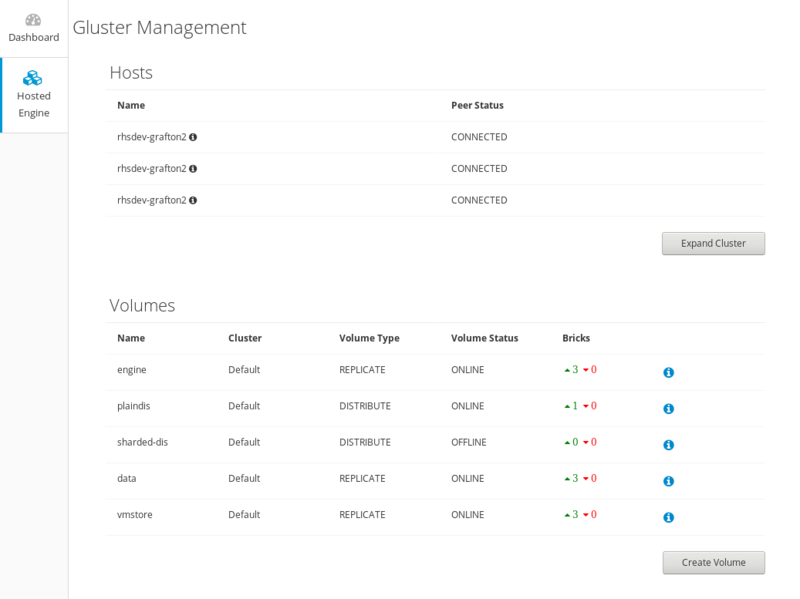 The Gluster Management dashboard lets you view information about the currently configured Gluster volumes in your hyperconverged cluster. Click Virtualization → Hosted Engine to reach the Hosted Engine dashboard. Click Manage Gluster to reach the Gluster Management dashboard. 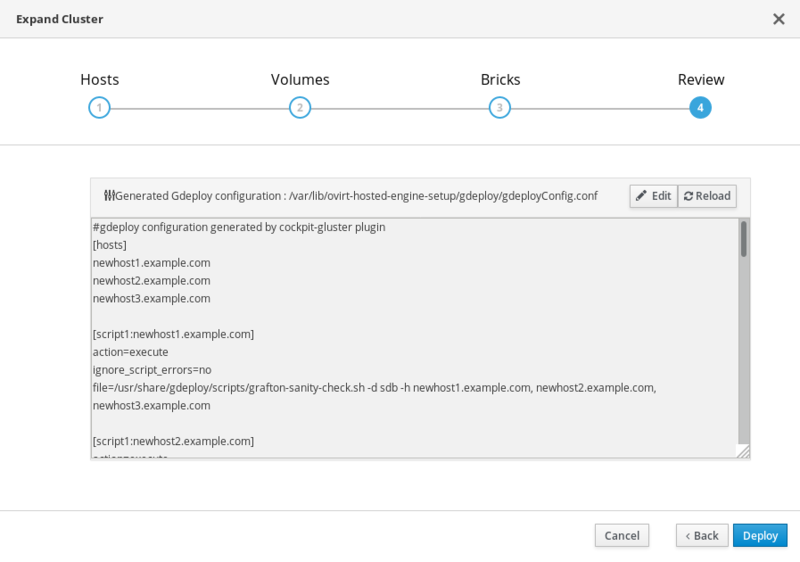 Follow these instructions to use the Cockpit UI to expand your hyperconverged cluster. Verify that your scaling plans are supported. If your existing deployment uses certificates signed by a Certificate Authority for encryption, prepare the certificates that will be required for the new nodes. Install three physical machines to serve as the new hyperconverged nodes. 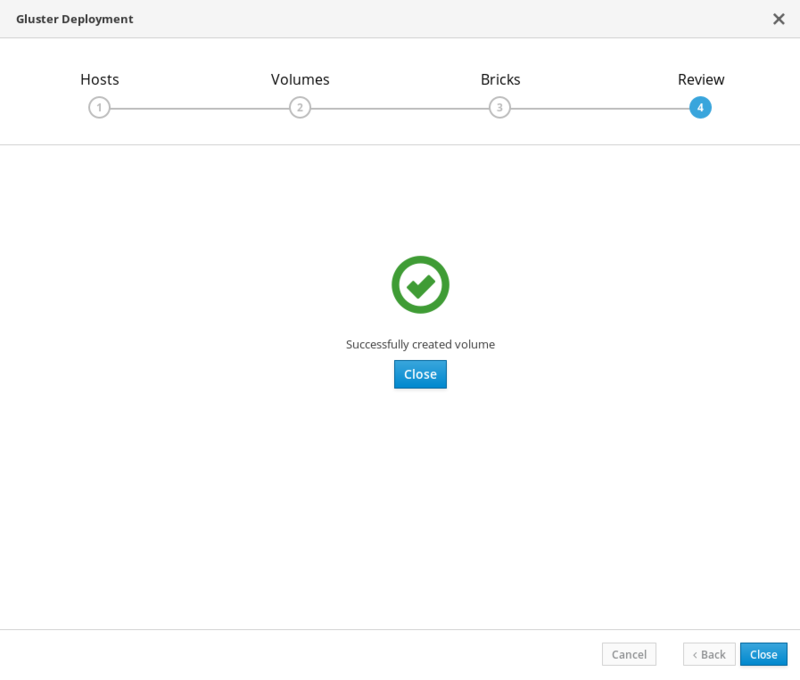 Follow the instructions in Deploying Red Hat Hyperconverged Infrastructure for Virtualization. Configure key-based SSH authentication without a password. Configure this from the node that is running Cockpit to all new nodes, and from the first new node to all other new nodes. RHHI for Virtualization expects key-based SSH authentication without a password between these nodes for both IP addresses and FQDNs. Ensure that you configure key-based SSH authentication between these machines for the IP address and FQDN of all storage and management network interfaces. Follow the instructions in Using key-based authentication to configure key-based SSH authentication without a password. 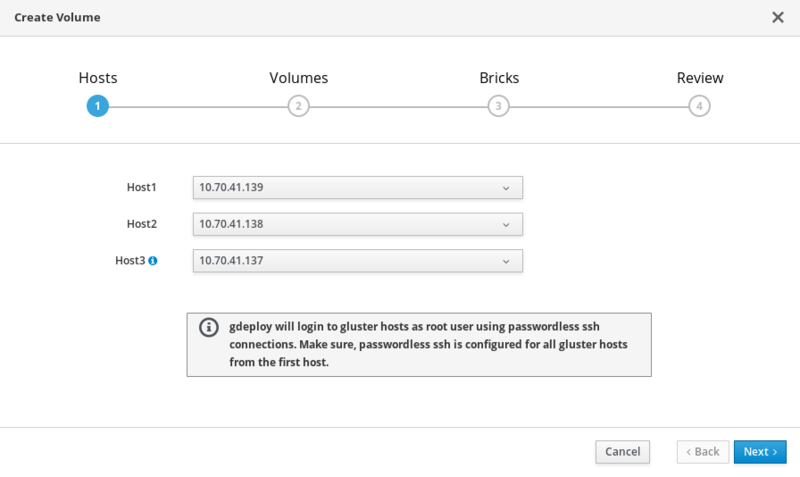 Click Virtualization → Hosted Engine and then click Manage Gluster. Click Expand Cluster. 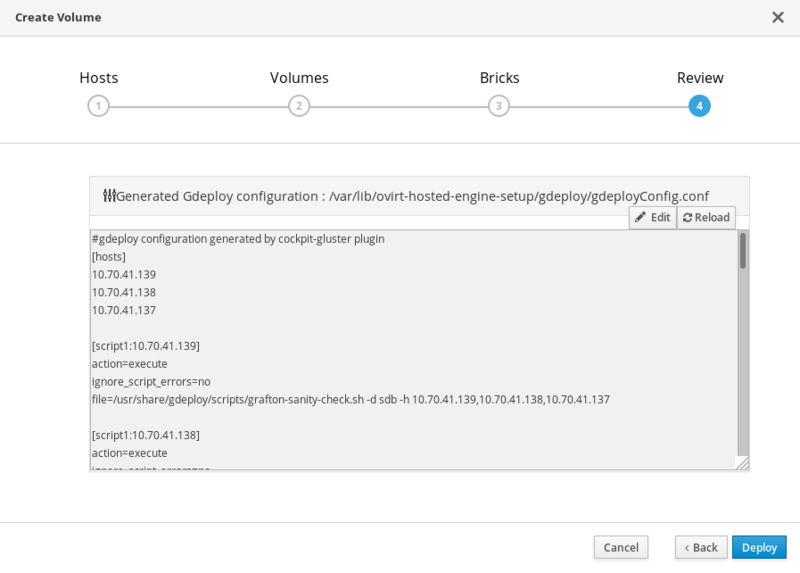 The Gluster Deployment window opens. 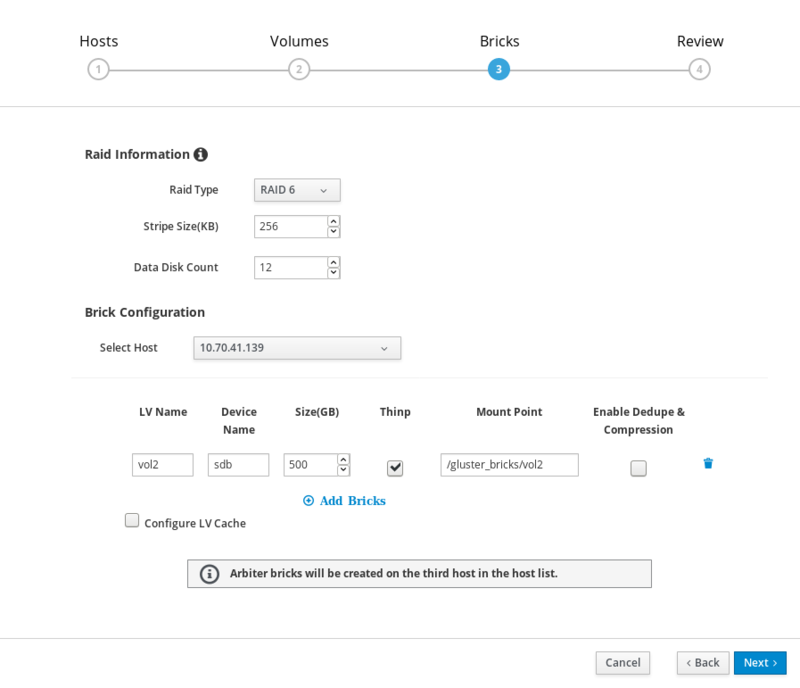 On the Hosts tab, enter the FQDN or IP address of the new hyperconverged nodes and click Next. On the Volumes tab, specify the details of the volume you want to create. On the Bricks tab, specify the details of the disks to be used to create the Gluster volume. On the Review tab, check the generated gdeploy file for any problems. When you are satisfied, click Deploy. Deployment takes some time to complete. The following screen appears when the cluster has been successfully expanded. 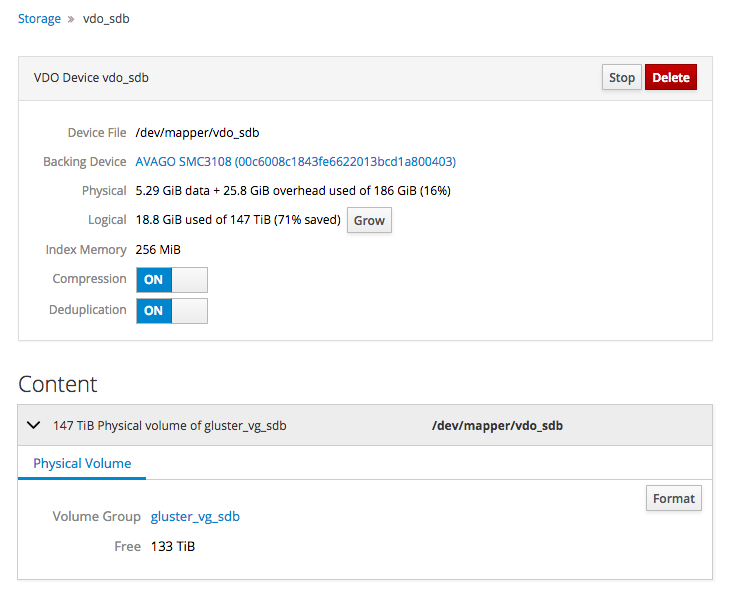 Follow these instructions to use the Cockpit UI to create a new Red Hat Gluster Storage volume using raw disks that are available on hyperconverged hosts in your cluster. Verify that the raw disk drives you plan to use for the new volume are visible under the Drives section of the Storage Dashboard, and do not have any file systems listed on their Drive Overview page. Click Create Volume. The Create Volume window opens. On the Hosts tab, select three different hyperconverged hosts with unused disks and click Next. On the Volumes tab, specify the details of the volume you want to create and click Next. On the Bricks tab, specify the details of the disks to be used to create the volume and click Next. On the Review tab, check the generated configuration file for any incorrect information. When you are satisfied, click Deploy. The following screen is displayed when deployment completes successfully.